This is a straw hat with plenty of class. 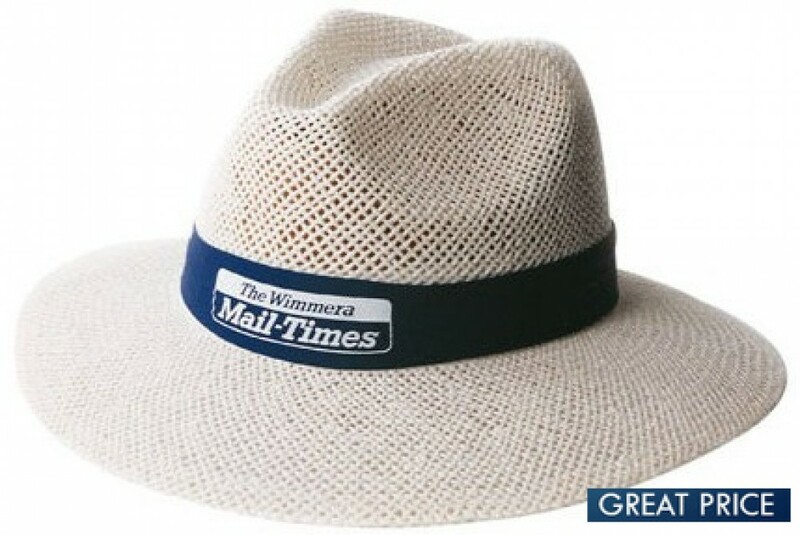 It is beautifully moulded in Madrid-styled shape, with a wide fully brim fully encircling the hat. This provides all-round shade, helping to protect your face and neck from the Australian sun. Made of woven straw, these caps have plenty of ventilation to keep the head cool. A dash of colour is added by a cloth hatband, which is where we print or embroider your custom branding. The hat only comes in white but is available in two sizes -- Large/eXtra Large. Branded with your logo, these straw hats are great for those situations in which a cap is just not enough. With its quality construction and all-round sun protection, these hats would be great for those who work outdoors, including lifeguards, garden workers, umpires, and tour guides. They also make great promotional retail items, especially in warm and tropical areas, or club accessories for bushwalking or other outdoors clubs. All of our products come with 8000 stitches of embroidery as standard. Other branding options are also available -- just ask our friendly sales staff for details. Embroidery on this hat would be situated on the hatband. Please provide branding artwork in eps, pdf or high resolution jpeg format. Delivery charges and GST are not included in the listed prices.